Chess: We met about 2 years ago. First of all, Tim and Tara met singing at a gig and got chatting about their similar love for music genres that they liked, and then quite quickly after that were introduced to AJ and I through mutual friends. They’d had an idea about putting together a band and wanting to sing with more voices because of the harmonies and the music that they’d talked about initially. Quite soon after that, we went to Tim’s flat in Crouch End and sat round singing some stuff that Tim had written, and we realized that we might have stumbled upon something worth trying again, because the way everyone’s voices worked, the way it all seamlessly happened, it felt a bit like fate. So we put a song up on SoundCloud in the next rehearsal which was then picked up half an hour later by our now-management, and then it’s been one thing after another – from Decca to publishing, to all the rest of it. What was the first music you all bonded over? AJ: I think it’s fair to say that Chris Stapleton and First Aid Kit were artists that we’d been listening to separately and then discovered that we all had that connection when we first got together, despite having quite different music tastes in some ways. Tim: Growing up, it would be Fleetwood Mac or Simon and Garfunkel, stuff like that, so we kind of had all those bases covered. C: Yes, it’ll be released at the start of next year, so we’re very excited about that. We’ve worked really hard and we wrote a lot of songs for it. It’s been an amazing process for us to go through, recording that and writing it, we’ve learnt a lot as a band about the craft it takes to make a record and we’ve loved it. Do you have any particular song writing process? Tara: We don’t really write in the same way every time. Sometimes it might be that AJ’s come up with a lyric he really likes, or Tim’s got a melody, we kind of all work together. While we write as individuals, it definitely works better when it’s the four of us together. What made you choose the singles you’ve released? C: I think “Wish I Could” was an obvious choice for a first single, it was one of the first songs we’d written together. We’d had it for such a long time and we were still just as in love with it as when we’d first wrote it. Tim: It’s kind of an instant sing-along one. C: And again, with “Devil”, it was the same, it just made sense. Tim: [Third single “Burning Bridges”] is probably the hardest one to choose, the third one. We’ve gone quite off-paste with this one. It’s very different to the first two which probably makes us love it even more, to be honest. Have you got any live dates coming up to promote your album? C: We will be doing a UK tour when the album comes out, which will be February time, and then hopefully we’ll be doing a bunch more dates, maybe a few dates before Christmas. We’re going to be going out to Nashville and playing some shows out there in the summer, so we’re really excited about that. That sounds amazing. Have you done much touring before? Tara: We were lucky we got to support Marty Stewart, who’s just incredible, on his UK tour, so we did five dates with him which took us to Glasgow, Manchester, Newcastle, Birmingham and London, and that was our first taste of touring as a band. I know in previous lives, Tim and AJ in particular spent a long time touring up and down the country doing stuff, but it’s the first time we’ve done it as a band. Have you had a favourite venue that you’ve played? Tara: Purely aesthetically, Royal Holloway was beautiful. C: Bath, I think. I loved Bath. Tim: [Bath] was probably my favourite. AJ: I don’t know but I’ve got to say, I’m liking the look of Huddersfield! 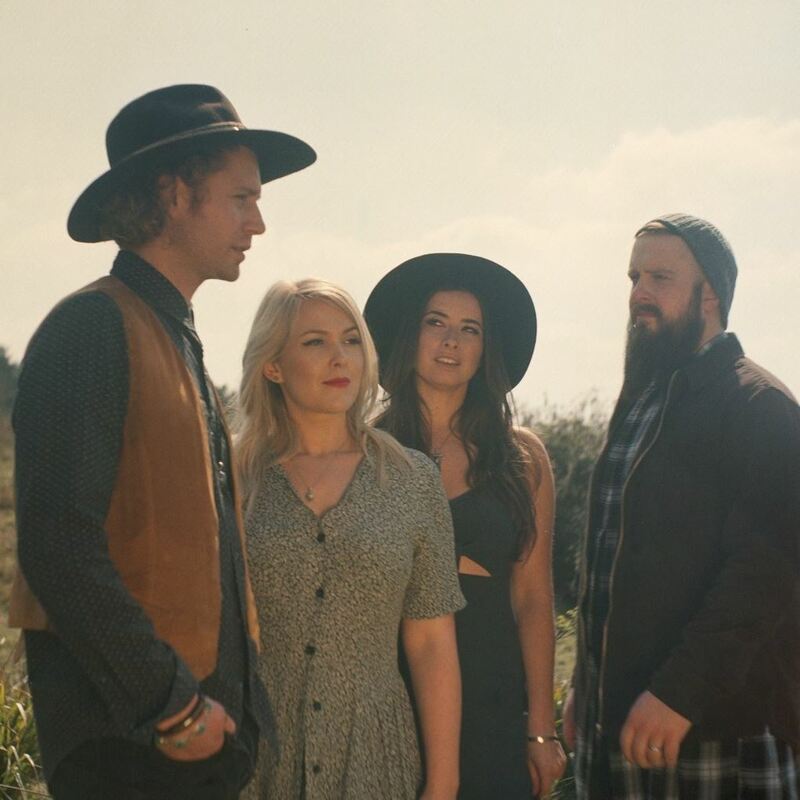 The Wandering Hearts, London’s rapidly-rising country-pop four piece, really do bring a new dynamic to their music in a live setting. The sound is stripped back, but not to the point of being dull. Tim provides a stomping pulse on his little kick drum while his rhythmic guitar gallops along, and the chime of Chess’ mandolin is sparse but effective. The vocal harmonies which define the band’s signature sound are lush as ever. They rise and fall with the songs, building slowly before dropping away softly. The whole thing is very intimate, and the cottony vocals in particular feel like a cushion around your head, even in the noisy cafeteria where they performed their short-but-sweet set. The country-pop genre may be full of sound-alikes, but the Wandering Hearts certainly bring something new to the table.